Definitely better. 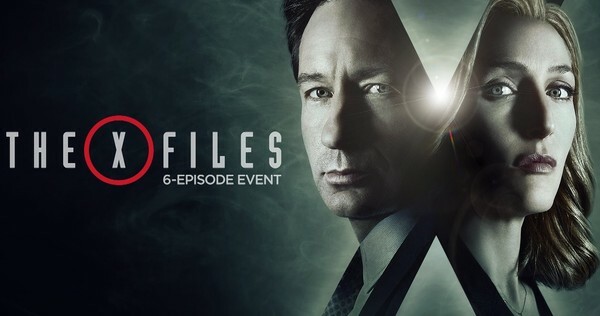 I wonder if what's keeping me from properly enjoying this run of episodes is that I keep trying to work out the point of this new series of the X-Files? Beyond just making more episodes of the X-Files; obviously. When Doctor Who came back it made sure to tell stories that wouldn't have been possible during the original run. The remake of Battlestar Galactica took the premise of the original series and then wrote plots about religion and paranoia and the War on Terror. Star Trek: The Next Generation took great pains in the first series to distance itself from the looming shadow of the original series ("the Klingons are our friends now...ooh look here come the Ferengi"). And then the X-Files comes back and starts acting like Clinton is still President. If the series is being made to provide a jolt of nostalgia for people like me then why risk alienating existing fans with the mass junking of the series mythology in episode one? If these new episodes are to capture a new generation of fans then why draw so heavily on the past; as the second episode does when it tries to reach closure with regard to Mulder and Scully's child? And, to be honest, I'd forgotten they even had a child. I dropped those later seasons down the memory hole. 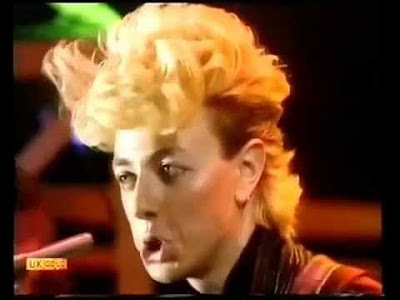 Top of the Pops 5 February 1981 Hey! Shown on BBC4. Hey! Reviewed by Chris Arnsby. Hey! Simon Bates: "And it's a runaway success for a start 'cos we've got the Stray Cats to kick off Top of the Pops, with Rock This Town. Over here." Stray Cats singer carries on despite the souffle on his head. Stray Cats: Rock This Town . The Stray Cats have got the audience jumping. Possibly too much. A close-up of feet, as some of the audience dance on the staggered seating area behind the band, shows the flimsy wooden rostrum surface is bouncing up and down alarmingly. Also in wide shots of the studio some of the audience seem to have been penned behind a chain link fence. Is Top of the Pops segregated now? Are there dancing and non-dancing areas? Or sullen, and non-sullen? Blondie: Rapture  A second outing for the video first seen on the 22/01/1981 edition. Spandau Ballet: The Freeze . Followed by a repeat of the Spandau Ballet performance from the same programme. Better. Not great but a step in the right direction. If I wanted to sum up this episode in a few words I'd describe it as business as usual. And that might be the core of my problem. Should the second episode back after a fourteen year gap feel more like series 23 episode 2? I'm aware that this makes me seem wildly inconsistent. Last week I was whining about the wholesale ditching of the previous mythology of the series, now I'm grumbling that this episode feels too familiar. But it seems odd that after going to all the trouble to junk the previous back story last week the X-Files is suddenly content to tread water with an episode which feels like it could have been made at any time. The comic book superhero film that pokes fun at comic book superhero films! One day Deadpool may bite Marvel where it hurts because in their latest zippy comic adaptation they pretty much manage to take the rise out of all the things they do in their other comic adaptations! It makes the preceding trailers- on this occasion for forthcoming X Men and Superman vs Batman films seem a little dry and sombre. No chance of that happening with Deadpool which opens in the same irreverent fashion in which it intends to go on. Over a freeze frame of a calamitous spinning car hanging perilously in the air, the titles eschew naming the cast and instead describe each character type the film possesses. 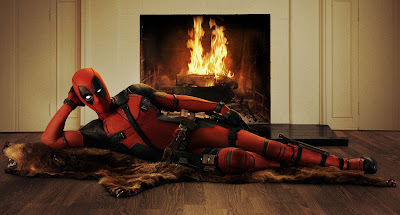 At various junctures throughout the movie, the fourth wall is broken not simply by Deadpool speaking directly to camera but also by his commenting on the fact he’s doing so or on some other aspect of the movie. The violence is bloody, the language R rated in the States. About three quarters of the way through you imagine you’ll tire of this or else the film will lurch into something more serious but you don’t and it doesn’t. The fact that it is made by the same studio who also make the serious films it is ribbing and the fact that Deadpool has been a mighty success could, as I said at the start, give Marvel one giant headache. The Beeb’s boldest channel heads into the hinterland…. Out of all of the BBC’s channels, BBC3 has struggled most to find its identity. Largely filled with repeats it has a low average for producing memorable programmes of its own yet when it does they are generally interesting. Now it is moving online complete with its hilarious new logo which is surely taken from the comedy WIA. Indeed it is easy to imagine the design committee sat on rocking horse styled red seats or something thinking it up. Yet even that move has hardly been smoothly done. Despite the enthusiastic efforts to present it as a reaction to the way young people watch television (not that young people watch much television anyway) when it is really a move born out of government cuts is perhaps understandable. Announcing that any new programmes will also be shown on either BBC2 or BBC4 seems to make the move pointless. Not to mention the awkward idea of presenting a `channel` in the format of a `platform`. It is another example of the BBC racing to dismantle itself before the government does, as if that is any better. The whole operation feels like a decision taken by about 30 different people each of whom see `online` as something different. While sitting on orange beanbags probably. Tommy Vance: "Hi everybody. Good evening and welcome once again to Top of the Pops. This is the programme that does not hang around. Immediately we bring you the Slade and We'll Bring The House Down." Slade: We'll Bring The House Down . "The programme that does not hang around". Tommy Vance predicting the future BBC4 schedule there as the programme continues its breakneck two episodes a week pace. Could BBC4 have a plan to show 1982 in the second half of 2016? There's only one way to find out. *waits*. 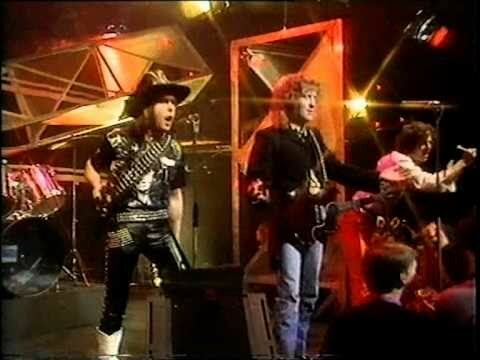 Meanwhile, here's Slade back on Top of the Pops for the first time in years. 27 October 1977 seems to have been the last time they appeared, sandwiched between Santana and Mary Mason, performing My Baby Left Me – That’s All Right (Medley) which reached the dizzy chart height of 50. Slade still know how to work an audience and this is a great start to the programme. Slade: Noddy's forgotten the words. 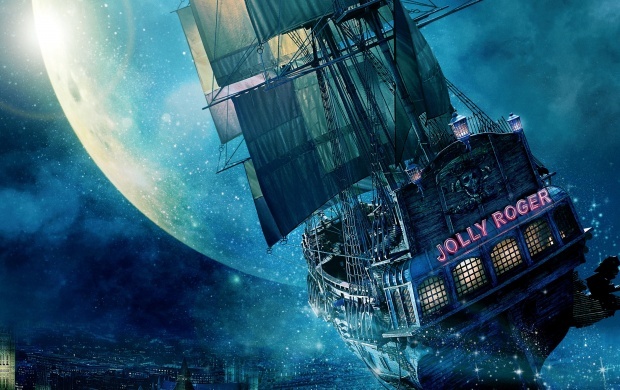 People just don’t seem to like films with flying ships in them! After everyone but me seemed to dislike the last version of The Three Musketeers and its airships, along comes a prequel to Peter Pan complete with flying sailing ships that nobody likes either. I suppose there may be other reasons why the film failed to spark at the box office but I really like the chaos and sometimes the messiness of it. I know if I were the age at which it is primarily aimed it would probably be my favourite film in ages. Trouble with today’s kids is they are just too sophisticated and obsessed with being cool. Childhood should be about mistakes and mess as well! The X Files is back! There are several moments when it seems as if the first episode of the all-new X-Files will collapse under its own weight. Worryingly the first comes right at the beginning. An extended story-so-far monologue which attempts to summarise nine series and two films worth of material while also quietly ignoring some of the less successful moments (Agents Doggett and Reyes we hardly knew ye). This segues into a history of UFO sightings, complete with nice looking faked footage, and ends with the crash at Roswell. It's a relief when the familiar theme and title sequence appear. This does a much better job of reassuring the audience that it's business as usual than a few photographs of Flukeman, or Eugene Tooms. Although the demands of modern television mean that the title sequence is cut short. Bad news for fans of the screaming face, or germinating seeds with the superimposed words paranormal activity. It was on 6 February 2011 that I put up the first post and after 648 posts in total its now reached this anniversary. A lot has changed in that time, both in my life and in the world, and I felt it was worth acknowledging this landmark. Of course This Way Up as a title goes back to 2002 when it started as a printed fanzine but those issues were on the whole seen by far fewer people than have viewed the blog. Blogs were already old hat when I started this but they continue to thrive. This may be because it’s a very adaptable format and it doesn’t matter how much or little you decide to post. The problem with the paper issues was filling that awkward half page or having to wait until all the material appeared. With the blog, if there isn’t anything particular to say then I don’t have to come up with something. Also with the zine once the issue had been available for a few months, it had effectively finished its life span until it turned up ten years later at a car boot sale whereas here posts from the very start of the blog can still be viewed indefinitely. Peter Powell: "Hi folks! Welcome to Top of the Pops! Well we've started and I'm glad you could join us for this Thursday night edition starting off with The Look and I Am The Beat!" The Look: I Am The Beat . Congratulations to Vision Mixer Hilary West for a perfectly timed cut right at the top of the programme. Top of the Pops begins with a close-up of the big Eidophor screen, and as the introduction to I Am The Beat plays the camera slowly zooms out to Peter Powell before zooming back in across the audience to the stage where The Look are playing; with a spot on cut to a different camera just as the lyrics begin. Yes it's a small moment, but it's the kind of small moment which adds impact and excitement to the show even if the viewers at home don't notice. In fact this is a very slickly recorded performance with lots of swooping crane shots (and inevitably lots of turning audience heads as they realise a camera is bearing down on them), and another nicely timed camera move at the end of the performance with a pull back from The Look to Peter Powell. The only oddity is the empty audience area at the back of the stage. Shots of The Look are sometimes a bit sparce because they lack the normal background of people dancing (or sitting and looking bored, this is the Top of the Pops audience we're talking about). This is still a brilliant song, and The Look become the first band of 1981 (or 2016 if you prefer) to get my hard earned 99p in exchange for a copy of the single.